Elvis Presley and the Beatles: Who was better? Was Elvis Presley a Better Musician Than the Beatles? 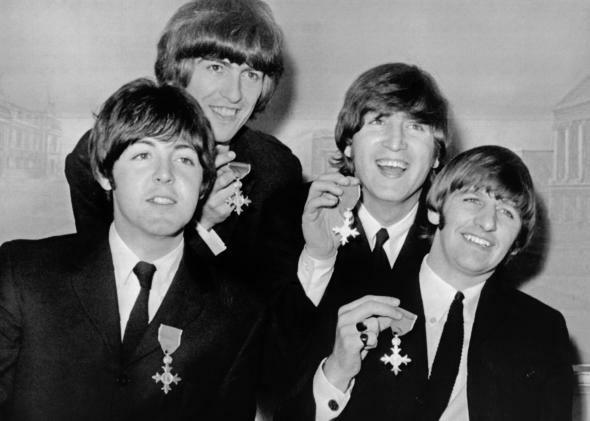 The Beatles hold up their British Empire Medal awards following their investiture on Oct. 26, 1965, at Buckingham Palace in London. Vocally: Elvis had a great voice, and few could touch him. His rock ’n’ roll numbers were electrifying, and his slower ballads were beautiful. His ability to command a song was just fantastic. The Beatles all had good voices (except Ringo Starr, obviously), but they couldn’t touch Elvis for vocal ability. Instrumentally: The Beatles weren’t virtuosos on their instruments. There aren’t too many moments in the Beatles catalog that can’t be replicated by a reasonably proficient amateur guitarist, bassist, or drummer. But they were all better than Elvis, who was a rudimentary guitarist at best. (Paul McCartney actually gave Elvis a brief bass guitar lesson.) But then Elvis didn’t need to be great on an instrument—he had a very hot band behind him early in his career and could call on session greats to provide backing. Stage presence: Elvis could really command a stage. He had an amazing presence that few could match. The Beatles were great in their early Hamburg days, but still not in the league of Elvis, who was only rivaled by James Brown and a handful of others. Later in their career, the Beatles were terrible onstage, but then how much effort would you put into your performance when nobody could hear a note you were playing over the screaming of the audience? Songwriting: John Lennon and McCartney were the greatest songwriting duo ever. George Harrison started slow, but eventually became one of the greats as well. Elvis on the other hand left the writing to other people. Career: The Beatles exploded on the musical scene late in 1962. They ended their career by the end of the decade. In their years together, they never recorded a dud album and didn’t endure a single career slump. They were flat-out brilliant for eight years. Elvis started with a bang, then joined the Army. After that, his career had moments, but for most of the 1960s and ’70s he was churning out terrible albums and making increasingly dire movies. He became a sad copy of what he once was and lost all relevance by the time he died. Innovation: The Beatles totally changed music forever. The impact they had on the creation of albums, live performing, studio production, and even where music was supposed to come from was massive. Their constant desire to reinvent, move forward, and progress was one of the things that set them apart from their competitors, who were often left in their wake. Elvis wasn’t really a pioneer. He was a white guy playing “race music,” but other than that he wasn’t a revolutionary. It depends on how you define “better” and which of those criteria are important to you in making your decision. Which you personally prefer comes down to your own musical preference and taste. I have a lot of respect for Elvis, and I enjoy some of his music. There are others who feel differently. Elvis Presley: Who was the greatest rock star of all time? Musicians: What does it take to become a singer in Japan? The Beatles: Are The Beatles overrated or underrated?